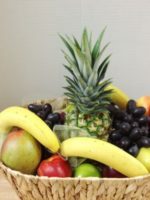 This Fancy Fresh Fruit Cookies Basket is loaded with goodies for all occasions. Great for an office, a birthday celebration, a Christmas gift, a thank you or housewarming, it is welcome at a hospice or for a family at their time of loss. 2 dozen fresh baked bakery-style cookies are added to an assortment of fresh, seasonal fruit, which might include apples, pears, mango, oranges, kiwi, pineapple and more. Located inside Roadrunner Florist is Basket Express, your one-stop-shopping for personalized gift baskets for all occasions. Every gift basket designed by Basket Express is unique to you. 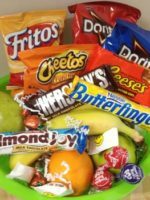 This Fancy Fresh Fruit Cookies Basket is loaded with goodies for all occasions. Great for an office, a Christmas gift, a birthday celebration, a thank you or housewarming, it is welcome at a hospice or for a family at their time of loss. 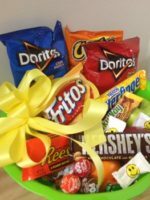 We can custom design this gift basket to your specifications. Want only chocolate chip cookies? Let us know. Someone allergic to orange? We can handle that, too. Simply call 602-246-1271 and let us custom design a Fancy Fresh Fruit Cookies Basket for you! 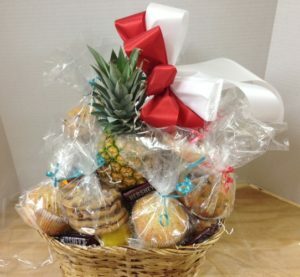 You might prefer our fresh fruit, cookies, muffins gift basket.